Wedding invitation frame set flowers, leaves, watercolor, isolated on white. Floral bouquet design: garden pink rose cotton, succulent, eucalyptus branch greenery leaves. 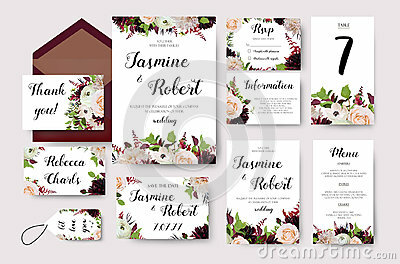 Botanical spring wedding invitation card design element, white roses flowers. Greeting card Poppies flowers. Can be used as invitation card for wedding, birthday and other holiday and summer background.